Hi Guys, Last week we shared Search engine Optimisation overview tutorial. 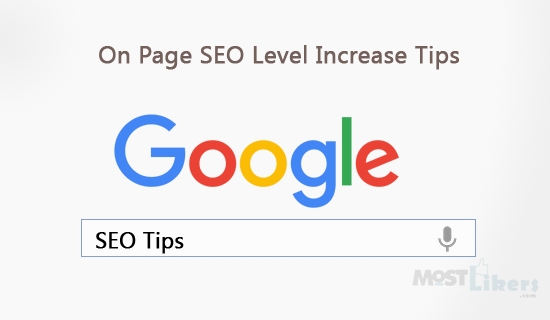 Let we discuss more How to increase On page SEO increase tips. on the page, On page SEO will refer all things that you can do on your website to make higher rank level. like meta description, content highlighting. Most of the websites doing some common mistake, they will update good content. But they won't get more pages views. For that kind of websites follow the below strategies you can more view and top searching google rank level. Metedata is the important for SEO. Every search engine will track Title,keywords,description based on metadata. So place the <meta> tags between your html <head> <meta> </head> tag. Metadata will not be displayed on the page but will be machine parsable. Each page place unique description, keyword. The Meta description is a textual content give some short description about the page. the text limit will be 160 characters. Incase of more than 250 character search engine won't read. Best Example for meta description search keyword in google checks the result. The Meta keywords Search engine will indicate the keywords off particular websites. Write your keyword very users friendly. Example: - People want to search 2BHK rent House in Bangalore. The title is the main part of SEO level. Based on the title only you can attract site visiter. The title display on your website browser tag. Search engine read your website and it's will take the title, meta tag.while someone search from the internet it will display your title. Some website's will same title for committers it's really the worst idea. Your title should be unique and easy user can understand what you're going to tel about the topic, Everything should cover with title. So i would suggest to you create unique title with the user-friendly title. For URL structure, CMS website like (google blog, Wordpress) it will generate automatically based on your title. For other user write clean URL don't use any special character. I have seen many shopping websites they will not follow proper URL structure on a product page. they will pass the product id data form the URL. Use htaccesss for SEO URL friendly structure. Highlight Your content using html tags like <bold> <italic> <h1><h2>...<h5>. This problem I am facing long back. my coontent is good but I won't get visiter later I reconges the problem. Presention is the simple trick male fall in love vistor in your websiters. People don't want to read all stuff website. They need some specific solution that's it. So High list your content, give some sub heading to read. Some place you can't describe all the things. there use image via explanation. Based on your image visitors can easy under what you're going to explain about the content. Image alt and title tags SEO - It helps search engines understand what an image is about. Alternate text will help case images on a page cannot be found. Image title text provides a title for an image. Internal links are links that go from one page on a website to a different page on the same website. Just navigate to a user. This trick will decrease website bouns rate and increase webpage hits. Follow Few tips to increase the internal link. Give Related Topics list end of the content. Give list New topic or Suggested topic. Share your website link to other websites. This tutorial I have shared basic things has to do with SEO. Hope this will helpful for you. The next topic on SEO section will share How to Improve offline tips.